Upwards of 400,000 people wound their way through the streets of New York City on September 21 in a heavily stage-managed affair dubbed the People’s Climate March. Coming just prior to yet another United Nations confab on climate change, the procession gave pride of place to Secretary-General Ban Ki-moon and an assortment of bourgeois VIPs. Organizers, sky-high over the throngs clamoring for “climate action,” gushed: “We are moving towards a brighter and more just future.” Some future. Within 24 hours, the U.S. imperialists were raining death and destruction on Syria; at home, killer cops getting started on a busy week had gunned down two mentally ill men in separate states. Meanwhile, working people are still drowning in a sea of debt. The march did manage to make a mark, mainly by leaving behind a sizable trail of litter for sanitation workers to clean up. Among the hundreds of diverse organizations that lent their names to the initiative were outfits espousing eco-socialism, demonstrating once again that this moniker is shorthand for grafting the most vapid anti-capitalist verbiage onto the bourgeois environmentalist agenda. Demanding climate action, as the eco-socialists do, is to urge the capitalist rulers to make some adjustments on energy-related matters. Genuine Marxists have an altogether different audience to set in motion for an altogether different purpose. That is the working class, the only force with the potential power and historic interest to sweep away capitalism and its many ravages through socialist revolution. Standing out among the brood of eco-socialists at the march was the System Change Not Climate Change (SCNCC) coalition. Its activists embraced the “big tent” event with the zeal of true-green acolytes, serving on the People’s Climate March Host Committee. 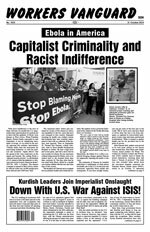 When a few radical liberals in the milieu, such as journalists Chris Hedges and Arun Gupta, bemoaned the openly corporate character of the march, elements in the SCNCC, centered in the International Socialist Organization (ISO), rushed to its defense. The critics did not exactly have to turn over a lot of rocks to get the dirt on the main forces behind the march, the liberal activist groups 350.org and Avaaz. The Rockefellers are well known to have funneled sizable sums into the coffers of 350.org; ditto billionaire George Soros and Avaaz (the global counterpart of his U.S.-based MoveOn.org). These two Democratic Party stalwart organizations, with their deep pockets, connections and market-based schemes to reduce carbon emissions, are out to fertilize the growth of green capitalism, although admittedly Avaaz has other pursuits, such as agitating for U.S. military intervention first in Libya and now Syria. Well aware of the potential for profit-making, some of the largest companies on the planet, Big Oil not excluded, issued a blizzard of climate solidarity statements pledging more support for renewable energy and greener supply chains, timed to coincide with the UN meeting. At that gathering, Barack Obama invoked the march in order to sanctimoniously wag his finger at China on the need to “answer the call.” Behind such efforts to chastise Beijing stands the imperialist drive for counterrevolution in the largest remaining country where capitalist rule has been overthrown. Meanwhile, the loudest climate alarm heard in bourgeois circles over the last month was sounded not by the parading masses but by Defense Secretary Chuck Hagel, who openly fretted over the national security threats it posed. “What puts bankers and hipsters in the same march?” was the tagline of an Avaaz-funded ad in NYC subways. Well, the bankers have visions of the piles of money to be made and also probably would not mind something like seawalls to protect lower Manhattan. Hipsters, as always, are attracted to fashionable causes. Many are moved by the countless dire predictions of the consequences of a warming world. Whatever the future holds, one thing is certain. As long as the capitalist order is not shattered and replaced with workers rule, the vast bulk of humanity will be at the mercy of the drive for profit, which breeds mass impoverishment and insecurity, threatens ever more outbreaks of war and runs counter to any attempt to rationally organize society to deal with the vagaries of nature. There certainly is no mystery as to what put the eco-socialists of the ISO and its SCNCC umbrella in the march. In his Socialist Worker (25 September) riposte “Against the Climate March Cynics,” ISO honcho Paul D’Amato goes through great contortions to dress up the demonstration as something more than a one-day street fair, even paraphrasing an online liberal handbook titled “Why Protest Events Are Not a Waste of Time.” Among other things, D’Amato sings the praises of 350.org and its founder Bill McKibben for having initiated a series of protests at a time when a Democrat sits in the White House and most liberal organizations refrain from such activity for fear of rocking the boat. Left unsaid, those protests, which the ISO habitually endorses, were designed to stiffen the resolve of the Obama administration. In its SCNCC activities, the ISO also closely collaborates with the small-time capitalist Green Party, and continues to run candidates on that ticket. The ISO’s making common cause with bourgeois elements does not make the climate march “cynics” right. To the contrary, they offer the same politics, only cloaked in somewhat more militant guise. Chris Hedges, for example, wrote of the need to “turn from a liberal agenda of reform to embrace a radical agenda of revolt” (“The Last Gasp of Climate Change Liberals,” truthdig.com, 31 August). What he had in mind was the next day’s 3,000-strong “Flood Wall Street” rally, where he helped fire up activists before they eventually sat down in civil disobedience for several hours on either side of the iconic bronze bull. Truth be told, there is no dichotomy between the People’s Climate March and Flood Wall Street; the two are part of the same political ecosystem. Indeed, the Occupy-style protest to “stop capitalism, end the climate crisis” simply bore moral witness to the fat cats and big wigs on the shortcomings of current bourgeois energy policy. Hence, the plaudits of NYC mayor Bill de Blasio afterwards. Environmentalism is still bourgeois politics when shorn of well-oiled PR machines and the active participation of the bourgeoisie or its paid representatives. The centrist Internationalist Group (IG) intimated otherwise in a leaflet titled “The Great ‘People’s Climate March’ Scam” that it distributed at the event. The IG emphatically announced: “The whole thing is a gigantic scam, a public relations stunt masquerading as social activism.” What scam? The march was, as advertised from the outset, an exercise in lobbying for the environmentalist cause. In a transparent effort to cater to anti-corporate opinions in the “climate justice” milieu, the IG borrows heavily from the green march critics, beginning with the plaint that it lacked concrete demands. So what? The entire purpose of climate activism is to advise the bourgeoisie on how best to fuel its economy. Tellingly, the pseudo-Marxist IG offers not a word of criticism of environmentalism or its eco-socialist variant. In fact, the actual scam is the very idea of eco-socialism. The main enemy for the left-wing eco forces is carbon, and implacable hostility to fossil fuels is a must; environmental degradation, especially that linked to climate change, trumps the exploitation of man by man and all other ills of class-divided society. According to this approach, for humanity to survive, progressive people must convince world leaders to shift economies away from carbon now, a recipe that inevitably entails cutting back personal consumption. In this project, sections of the bourgeoisie are ready and willing partners. In contrast, the main enemy for revolutionary socialists is the tiny class of capitalist exploiters who organize production to maximize profit, not to meet human need. Implacable hostility to the U.S. capitalist rulers, who have trampled underfoot working people and the oppressed the world over, is a must. Environmental degradation is just one of a host of problems, many far more pressing, linked to the workings of the capitalist system: unemployment, extreme poverty, mass starvation, uncontrolled epidemics and imperialist military adventures and conquest, to list a few. For humanity to survive (and thrive), the working class must seize power and expropriate the bourgeoisie, which would set the stage for a flourishing of the productive forces in a worldwide planned economy and the general satisfaction of want. In putting forward a threadbare anti-capitalism, the eco-socialists present the capitalist system as an engine of perpetual growth. Much the opposite is the case. Anarchic and crisis-ridden, production for private profit actually is a brake on development. The same inherent features of capitalism that reinforce material scarcity across the globe are barriers to addressing climate change on the necessary world scale. When the workers are running society, it might prove necessary to harness fossil fuels for a period of time to lift everyone out of backwardness. Only in the context of an international socialist economy that relegates hunger and poverty to the past can a rational plan be hammered out to modulate climate change and minimize its human toll.